After harvesting a full super of sage honey from my strongest (of only two) Carniolan hives, I placed the empty super back on the hive for them to clean up. Bad news is, this resulted in two things; an invasion of ants, and evidently some serious robbing by the other bees in the yard. The unfortunate result was that the Carni's absconded, leaving an empty hive. I broke it down and stored the frames, only to get a call from a trailer-park manager that a swarm had set up on their premises and they needed it removed. 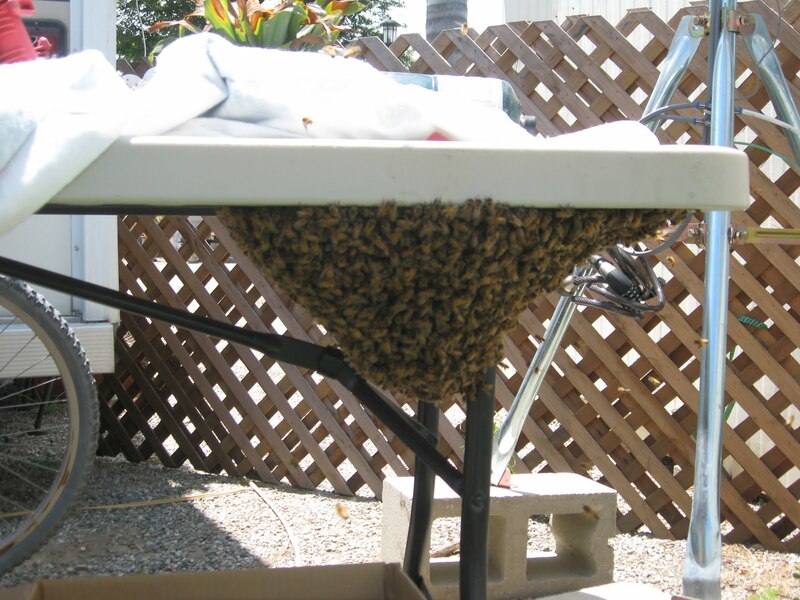 The location was in Ventura, which is too much of a drive to do a free swarm removal. As it happens I was heading in that general direction for another reason today, so I told him I'd stop by and get the swarm, but I'd have to charge $100. Still way more affordable than an exterminator, and he was fine with that. I suspected that this swarm had started to set up shop and create a hive, as they'd been there for 4 days and seemed to be behaving like a hive. Lots of waggle dancing going on, and when I looked underneath, just a boatload of bees. I put a cardboard box underneath and slowly pushed a paint scraper along the underside of the table, causing a good portion of the bees to fall into the box. I closed that box up; obtained another box from the park manager, and repeated the exercise with as much of the remaining cluster as I could. I sealed them up, took them home, and dumped both into the previously abandoned deep hive body. To give them a running start, since we're closing in on a dearth here, I alternated frames; using four of the drawn-out comb frames from the Carni hive, and six fresh foundation frames. (I didn't like the looks of some of the other Carni frames, and in fact found wax moths and/or wax moth larva on three of them, which I set out for foragers to clean up). 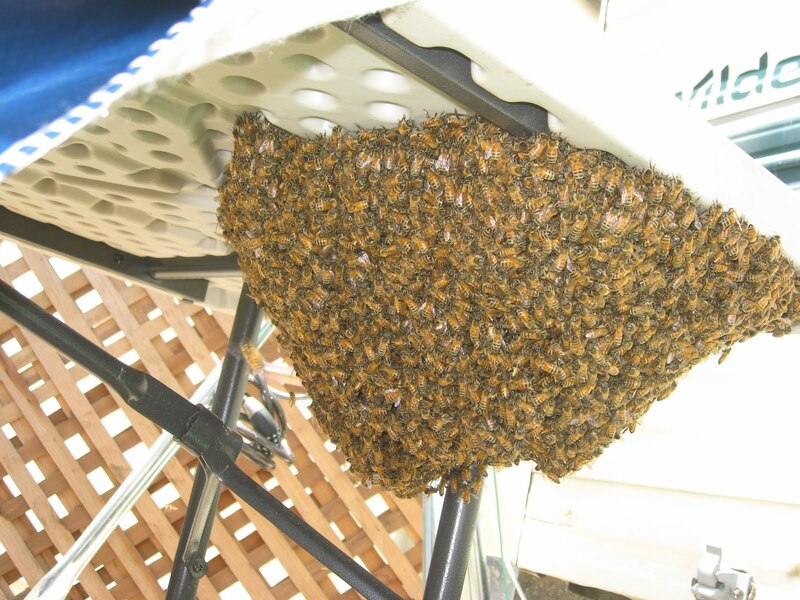 As of tonight it seems the relocated bees have settled, so I'm fairly confident I got the queen. Time will tell.